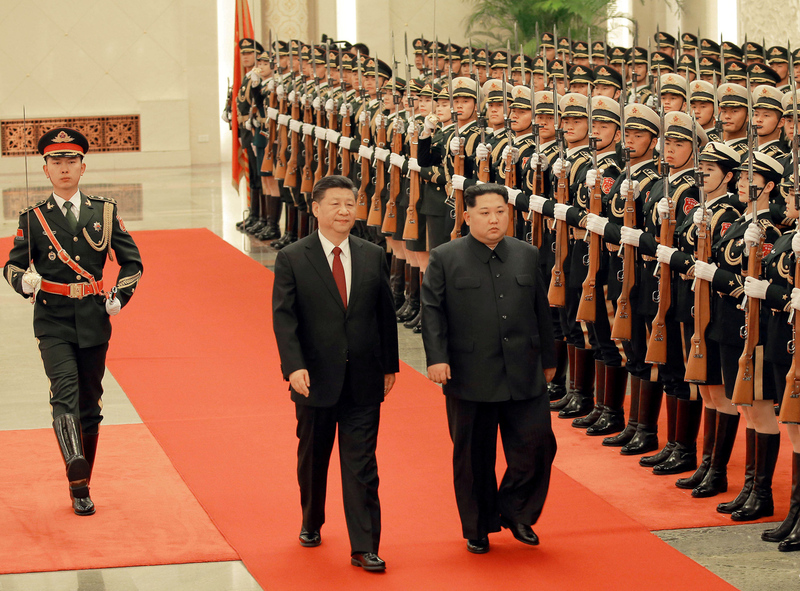 North Korean leader Kim Jong-un and Chinese President Xi Jinping inspect honor guards during Kim’s unofficial visit to China, in Beijing, March 28, 2018. Xi’s historical memory is not entirely accurate. Even in the age of Mao, whom Xi has done so much to imitate, China’s relations with North Korea were often plagued by hidden tensions and deep mistrust. This was especially the case during the Chinese Cultural Revolution, when the two countries nearly went to war over their disputed border. The Chinese radicals called Kim Jong-un’s grandfather, Kim Il-sung, a “fat revisionist” for failing to transplant the Cultural Revolution to North Korea. Yet it was Kim Il-sung who ultimately stepped away from the brink, reasoning that it was better to keep the powerful neighbor appeased. In the early 1970s, Sino-North Korean relations became close again. After their temporary estrangement, the “close relatives” made up, and in April 1975 Kim traveled to Beijing in his armored train to pay respects to ailing Mao. This was a time of tectonic changes in global politics. Prompted by his fears of a Soviet invasion, Mao had rethought his relationship with the United States. Edgar Snow, an American journalist whom Mao (erroneously) suspected of CIA connections, was stunned when Mao told him in December 1970 that Nixon should just “get on a plane and come.” “Nixon is a good fellow!,” Mao added. “I can get along with him in our talks. We won’t quarrel. . . You just [tell him] he is a good fellow! The number one good fellow in the world.” Nixon had by then signaled his willingness to improve relations with the Chinese, who, he said, should not be left in “angry isolation.” Backchannel discussions led to Kissinger’s now famous secret visit to China in July 1971, paving way for Nixon’s epochal appearance. China’s allies reacted to Nixon’s visit in different ways. Then still waging a brutal jungle war against the United States, the North Vietnamese felt betrayed. After trying but failing to convince Beijing to call off the visit, they launched a vicious offensive the spring of 1972 to prove to the Chinese and the Americans alike that they would not be cowed by great power machinations. But the North Korean leader, alone among Mao’s allies, thought that Nixon’s visit to China was a good thing. Archival documents, obtained by the Wilson Center’s History and Public Policy Program, show that Kim Il-sung was well aware of the optics of the Sino-American summitry. Having the “number one good fellow” turn up in Beijing was vaguely reminiscent of the way that tributary missions called on the Chinese emperors in the bygone days of China’s civilizational pre-eminence. Kim and Mao also discussed the personalities involved. “Kissinger is a very bad man, Nixon is better,” Mao told Kim. The latter agreed that Kissinger was “more wily.” There is little doubt, though, that should Nixon or Kissinger have decided to achieve a breakthrough in relations with North Korea, Pyongyang would have been most accommodating. Nothing would have raised Kim’s prestige as much as engagement with the United States. One of the reasons that Kim Il-sung became much more accommodating—even deferential—towards Mao in the early 1970s was that he wanted to reach out to Washington through the Chinese leadership. A North Korean delegation was in Beijing at the time of Nixon’s visit, lobbying with the Chinese to arrange for the American withdrawal from the Korean peninsula as a part of the broader Sino-American rapprochement. Much to Kim’s chagrin, the Chinese proved unwilling to put the Korean question high up on the agenda of their discussions with Nixon. The lesson of the early 1970s for North Korea was this: Never rely on your allies to look after your interests—they won’t. In the late 1970s, Kim tried to initiate direct contacts with the United States but without much success. Kim Jong-un is following in his grandfather’s footsteps. He understands that the geopolitical realities make it imperative for him to improve relations with China. Just as Kim Il-sung initiated rapprochement with China in the early 1970s, so Kim Jong-un thought better of his earlier defiance and paid his respects to Xi. The calculation is the same now as it was then: to use China for leverage against the United States. The optics matter. Just as Kim Il-sung saw the Mao-Nixon summit as Mao’s “huge victory,” his grandson, too, stands to bask in glory from meeting Trump. This direct dialogue with the United States, the ability to play on Seoul’s contradictions with Washington, and, most importantly perhaps, his stock of nuclear weapons, have placed Kim Jong-un in a far better position than his grandfather was in the early 1970s. The prospects for North Korea’s denuclearization remain dim at best. But Kim Jong-un—every bit as wily as his grandfather, and perhaps quite a bit better at pursuing the “revolutionary diplomatic line”—has already mended fences with China and put himself in the best possible position to shine in glory as he meets Trump. In 1972, the North Koreans welcomed the Sino-American summit, but with no means to influence the outcome, they had to cheer from the sidelines. Today, it is the Chinese who are cheering from the sidelines, striving to help Kim achieve his agenda. This is just where Kim Jong-un wants them to be.